NZ’s recent Budget shows it’s still a good time to invest in New Zealand with a surplus forecast in 2016, low inflation and good economic growth. Tight controls over spending with investment in crucial growth areas are an important part of this forecast. The rebuild in Christchurch is creating a skills shortage in some industries in NZ, creating opportunities for overseas workforce and specialist providers. Click here to read New Zealand Budget 2015 – what’s in it for Aussie business? 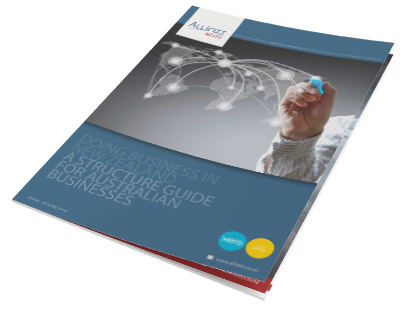 Alliott NZ in Auckland is a well-established firm with a solid track record in helping Australian businesses successfully set up in New Zealand – over 50 of them so far. Our NZ Budget 2015 summary has been specially created so you can discuss the opportunities with any clients who might be looking to grow or expand overseas. We understand that each client’s business is unique, so please call us on +64 9 520 9200 or email us today to discuss the best approach.